The list of hosts can be filtered by a filter string. When the filter is active, only the hosts matching the filter string will be shown. The other hosts are still present in the inventory, but hidden. Using a filter string, you can quickly narrow down a large scan to just the hosts you are interested in. 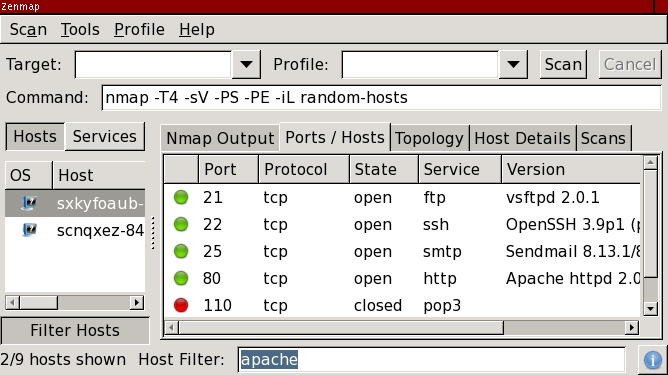 Figure 12.12 shows the host filter in action, finding the two hosts out of nine that match apache. The host filter is activated by clicking the “Filter Hosts” button, selecting “Filter Hosts” from the “Tools” menu, or pressing ctrl+L. This will raise the filter bar at the bottom of the screen. Hosts are filtered live as you type. To disable the filter, click “Filter Hosts” or press ctrl+L again to hide the filter bar. This simplest form of host filtering is basic keyword matching. Enter one or more strings such as apache, linux, or telnet, and it will match hosts that have the string anywhere in their information—as a hostname or IP address, port name or number, OS match, or service version string. If more than one word is in the filter string, all the words must match for a host to be shown. Here are some examples of host filter strings. This keyword search matches hosts that have been found to be running the Apache web server, but will also match any other host with “apache” in it, for example one named apache.example.com. This is like the previous string, but it will only match “apache” in a service version. Shows Linux hosts that are running SSH. Shows all hosts with port 445 open.